Sometimes it's easy to focus on the historical aspect of a house like the Gardner House and to forget that many families called it home. Hart County Judge Terry Martin (right, below) and his brother Glen lived in the house as boys just a few decades ago. 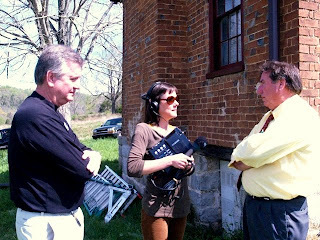 WKU Folk Studies Graduate student Rachel Hopkin, joined by Hart County News editor Jerry Matera, recently interviewed the Martin brothers about their time in the house. 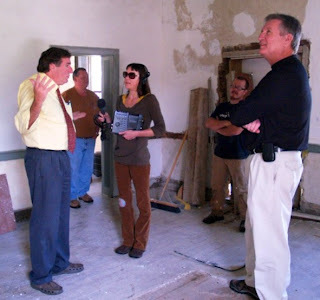 This was the first time they'd been back to the house since 1970 and they were very interested to see all the restoration work that has been done. The Martins showed Rachel where the added kitchen (now removed) had been situated and which upstairs bedroom they shared. They even laughed about falling down the steep, handrail-free staircase -- neither seems any the worse for wear, despite any possible tumbles. the mysteries solved by archaeological detective work and archival research, or why the Gardner House might be going by the wrong name.